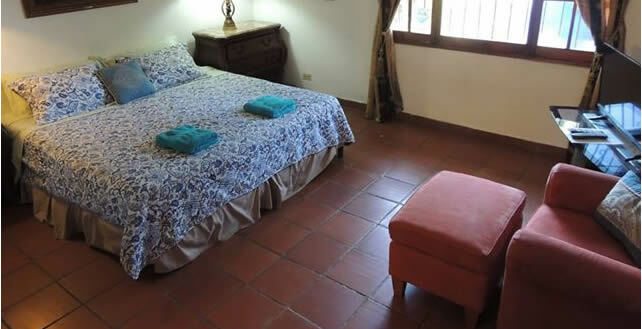 Boquete's Premier AirBnB & Large House for Short-Term Rental. to be a part of your vacation! Book your stay today! Check Availability. Have fun and be adventurous! Comfy couches, NetFlix on the big screen TV, games, foosball, hot showers, FREE bike usage, FREE laundry, FREE coffee/tea, FREE spices, FREE condiments, outdoor lounge area, indoor lounge area, HUGE fully-equipped kitchen, lending library, and many areas to relax! Reserve the Entire House Now! If you're staying at our AirBnB / Large House for Short-Term Rental but find it not large enough for your needs, tap into our expertise of the area to help you book outside facilities. Contact us for options and fees. La Jungla Experience is proud to support local events in and around Boquete - look for us in our La Jungla Experience t-shirts and say 'hola'! We also host many events on property for charity and fun. To find out what's happening, click here. Two large private rooms, (one with a king-sized orthopedic bed, en suite bathroom with hot water, television with Netflix; the other with a king-sized bed but shared bathroom with hot water). Both include WiFi, access to full kitchen with all the amenities, and nearby outdoor and upper lounge areas. More information and reservations. 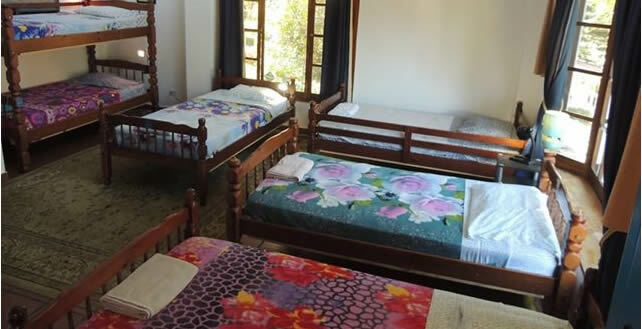 6 twin-sized beds, 1 full-sized bed, shared shower with hot water, lockers, lights, and fans. The overflow bed area includes WiFi, access to full kitchen with all the amenities, and nearby outdoor and upper lounge areas. Perfect for small groups! More information and reservations. Ready for your next great experience?